Missy and Will, a photo by Southworth Sailor on Flickr. Great wedding yesterday. 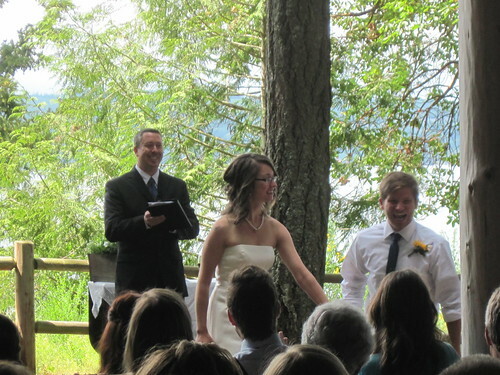 Missy Manning got married to Will Bleich at Kitsap Memorial Park. The weather didn't look too promising and we passed through a downpour on the way to the wedding, but the party was spared. As the afternoon progressed, the weather improved. The wedding was particularly emotional as brother Jeff walked Missy up the aisle and helped 'give her away.' The reception was great and since all the Bulthuis' were there including Ada and Ruby, we were able to share some family time afterward before everyone went home.